From the back cover: "When Faith Fairchild finds her husband Tom embracing nursery school teacher Lora Deane, she's alarmed, if only for an instant. The Reverand Thomas Fairchild has never been known for philandering, so Faith waits for the explanation. It seems that Laura, terrified by some threatening phone calls, has come seeking solace and advice from both Faith and Tom. It doesn't take Faith long to discover that Laura isn't the only Aleford resident being terrorized. Local environmentalists are outraged over a proposed housing development that will destroy Beecher's Bog and the more vocal opponents of the plan have become the targets of vicious anonymous letters. The police are called in, yet faith can't help doing her own sleuthing - while whipping up a batch of her famous Chocolate Crunch Cookies. 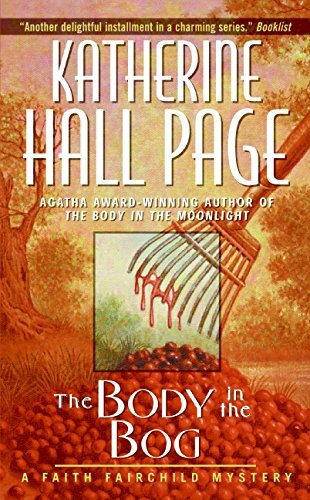 But when the heat is turned up on the controversy and a body is discovered in the charred ruins of a house fire, Faith finds herself investigating a murder...while trying to make sure she's not the next victim." Even though I had read this some time ago, I still enjoyed it a second time. Faith is one of my favourite sleuths. Release planned for sometime after 6:30 this evening. Released for week #20(word "the" in the title) of Never Judge a Book By Its Cover release challenge. Enjoy!